Faye Emerson, Julia Meade and Eva Gabor surround Goldie Hawkins on the cover of his 1959 album An Evening At Goldie's New York. His restaurants on New York City's 53rd Street and on Fire Island, N.Y. became a gathering place for entertainment figures. Julia was a regular and often sang with him. While he never asked his celebrated guests to perform, there were some fine moments. 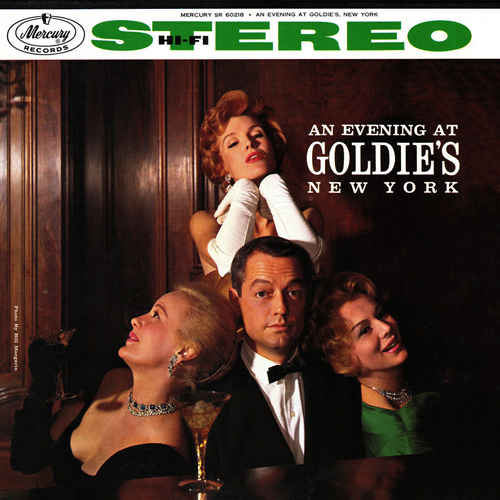 He taught Carol Channing to do the time-step for Gentlemen Prefer Blondes, and one evening when Fred Astaire and Gene Kelly were dining at the New York Goldie's, inspired by the beat of Goldie's piano, Astaire rose from the table and thrilled the clientele by dancing in the aisles.